The New Gloucester State Fish Hatchery was established in 1932. An initial hatchery building was constructed in the 1960s and then replaced in 1973 with what is now referred to as the "old" hatchery. In 1994, after drilling a new artesian well, a "new" hatchery building with office, work and living space was constructed, holding 25 circular "combi" tanks for early fry rearing. Water for the facility is supplied by Eddy Brook through a gravity fed system with an average flow of 1,000 gallons per minute. A drilled well provides around 100 gallons per minute of clean water at a constant temperate, making it ideal for accelerated egg incubation during the winter months. Species reared at the New Gloucester facility include brown trout. Originally constructed by the Federal Works Project Administration (WPA) during the Great Depression, it is the only remaining State facility that utilizes linear earthen pools for fish production. 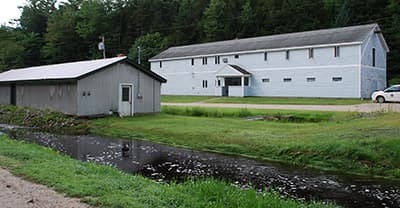 Serving as one of the key egg incubation facilities, it supplies all of the advanced rainbow and brown trout fry for the statewide stocking program. Most are then transferred to other locations for further grow out.